There are many methods for recording your CPD (Continuous Professional Development) plans available on the internet and through various professional bodies. Under each of the Categories I then divide into a number of Sub Categories so I can view how much training I have undertaken on a particular subject. These can vary as each Category can have many Sub Categories, however I do not split more than around 5 per one Category. This is the length of time that you spend learning. Even a 5 minute video here and there on a subject you are learning adds up. Under this heading I list the key points from the training as a reminder as to the learning points. Bit like a flash card. This is normally a list of the key points. 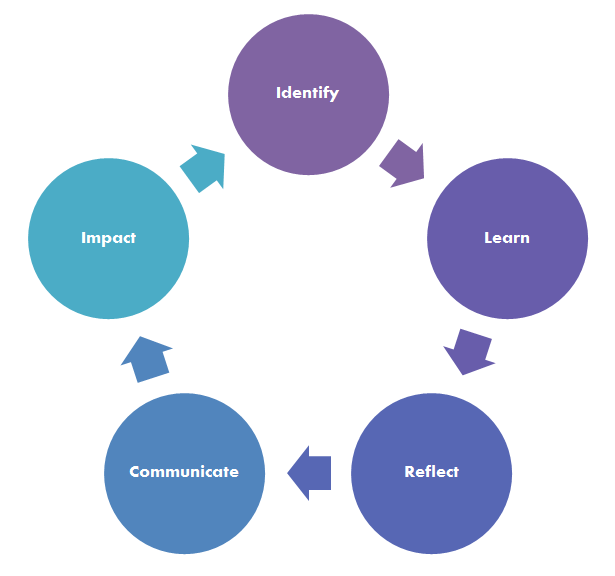 Using a CPD Cycle reminds me to reflect on what I have learnt and how I will apply it. Also what I need to relearn or expand on in future training. I am looking forward to this years TechDays Online 2015 which is being run between the 3rd and 5th February 2015. If you cant make the sessions then they normally appear on Microsoft Virtual Academy a few weeks later. This is being done over 3 days with a packed agenda that you can dip in and out of as needed. 14:20-14:55 20% + of Azure runs on Linux – why is this important and how to do it well? 10:40-11:25 How are you going to deploy that? 14:00-14:45 What is Roslyn and why should you care? I have written several blogs now on CPD and have received some good feedback. Following on from my post (How much CPD Training should you be doing)- and the post with the Survey Results, I received some good feedback from Jerry Overton. “I noticed a gap between the amount of training IT professionals think they should take and the amount they are actually able to take. I suppose there are many theories about why, but I speculate that it points to a problem with how training is usually structured. I think there is a huge need for microcourses/microlearning — short (5 min -20 min) focused courses delivered via laptop, tablet, or phone. With microlearning, you can context switcheasier. You can also fit training into the gaps in your life rather than having to make gaps big enough to fit the training. You can take 20 mins while you are waiting for a meeting to start, or 5 minutes while you wait at the doctor’s office. MicroLearning is not a new concept, but is an evolving area of learning and developing that is currently has and is being researched. 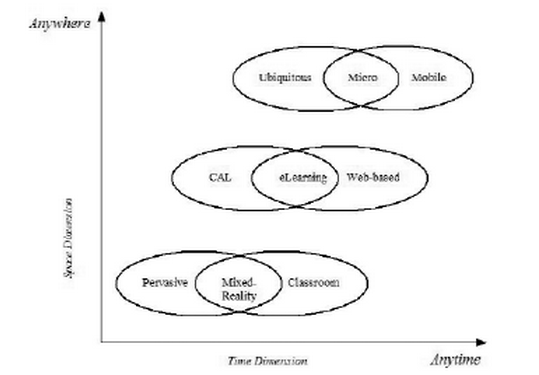 The paper also places MicroLearning combining their ubiquitous emergence and life long duration with the ability to consume anywhere through mobile learning. Business survival today extensively depends on harvesting, acquiring, retaining and applying fifth or sixth generation knowledge skills and capabilities. In view of these factors micro learning is relied upon to provide strategic solutions which could help enterprise growth through sustained maintenance of knowledge assets by evaluating current and future knowledge gaps. Core knowledge skills achieved under micro learning are intended to enhance organization learning and performance productivity. SkillPort have produced a number of 3-7 minute videos on leadership covering a range of topics within this area. each are focused and directed to a particular subject. This method could be applied to a number of subjects and topics. The BBC has been producing MicroLearning for a while based on its Bitsize series of videos and texts. This platform provides learning and revision for those studying GCSE and School Subjects. Again these method could be applied to a number of subjects and topics. The term MicroLearning my be new to some, however you may be MicroLearning already and not realising it. People who use Social Media will have carried out a form of MicroLearning reading small chunks of information in 140 Characters in the form of tweets from twitter. Filtering out the “Social Chatter” there are some good nuggets of information and learning tweeted on a daily basis. How much MicroLearning have you done today? From the recent CPD and Learning Survey that I recently ran, I want to now start looking at the comments that have been left by the respondents. Rather than just list them, I will blog about them individually or group a couple as some of the comments provide an interesting insight into how CPD (Continuous Professional Development) is considered. All entries to this survey were anonymous. From my experiences working and learning, I have found that any learning done in and outside work around the areas that I do during my daily working career have been applied without thinking about it. Personally I would find it hard to apply a level of consciousness to separate any learning done in my own time to my job, unless it was a very different type of learning (such as learning to canoe or play the piano). Providing support does provide a better culture for learning in the workplace, but this is a two way street and employers may require you to develop your skills with the same time they provide inside work as outside work. 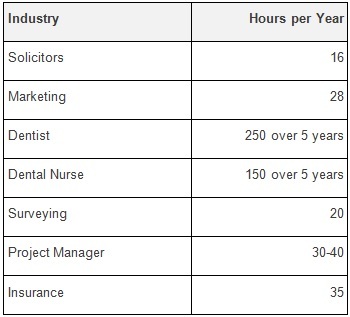 Looking out across the various industries and their CPD requirement, some industry verticals have to do development to keep their qualifications such as the medical profession. There is a mixed bag of support and no support for employees, however they are doing it as part of their daily routines. To CPD or not to CPD that is the question? For me the answer to this is simple. If you do not decide to carry out your own CPD, others around you most probably are. The next generations of IT Professionals are already learning from an early age supported by Government Educational Curriculum’s. These types of support will bolster the IT Industry and with more choosing it as a career also drive towards the Era of the Contextual Web. The next generation will develop key skills at an early age that they can just create the tools and applications that they need when they want them. Maybe they wont spend much time playing the xBox or Playstation, but coding them instead. The next level of Innovation and entrepreneurship may just come from a 10-11 year old! Learning can feel like “Keeping up with the Jones” and a “marathon” at times, but if you do not have a plan to develop, you may be on the pavement cheering those who do by. Following on from the results of the Survey that I recently ran (Results from IT Professionals and CPD Survey) the below is some further analysis on the results. Q4. How many hours do you complete annually developing/learning? Q6. 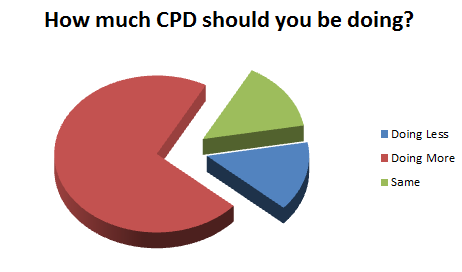 How many hours do you think IT Professionals should spend on CPD annually? shows that the majority, 15 respondents think they should be doing more training than they actually are managing. 3 have indicated the level they are doing is about right and 3 consider they should be doing less. Having graphed these results the graph look rather like a character from an old computer game. Perhaps the title of the blog post should have been “Eating a slice of the Training Pie!”. The results averages out at about 57 hours above what the respondents have recorded as being done at the moment. The respondents with the same level of training average at doing 96 hours. The respondents looking at less training average at doing 23 hours less. So how much more training should you be doing? Overall the respondents were fairly even across the number of hours that should be carried out annually. 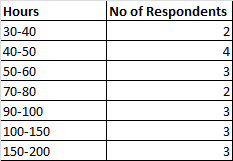 the highest vote by respondents in the survey was 40-50 hours. Looking at other professions this feels about right as a reasonable level of development. and should perhaps be where in the main people looking to develop should try to achieve per annum. I would welcome any other views on this.